Half Marathon Route (21.1 km) This year, just like the previous ones, the routes of Navarino Challenge are renewed and more “challenging” than ever! The route of the Half Marathon starts inside the facilities of Costa Navarino at the bicycle rental area (Navarino Outdoors) and is directed towards the south exit of the complex following the asphalt road slightly uphill for about 500 meters. After exiting the complex, the route turns sharply right into a dirt road towards the beach and downhill. After a distance of running by the sea, it diverges from the beach and follows an uphill track up to 2.5km. It continues on asphalt with slight downhill for 200 meters while the next kilometer (from 3.2km. up to 4.2km.) is the most uphill track of the route. The next kilometer is downhill till the wildlife shelter of Lake Divariou where following the dirt road, we end up at Voidokilia beach where the most beautiful but also demanding part of the route begins. At this point the route goes around the beach by the sea on the golden sand for 650 m. At the end of the beach it moves left towards the dunes to be driven on a narrow dirt road for about one kilometer around Lake Divariou. Then it diverges from the lake, following a wide dirt road till the pumping station where meets the lake again, to continue moving around within the wetland from the 9th km. up to 13th km. where again meets Voidokilia beach. Having now entered the way back, we move to the mainland on a dirt road in rural area until Petrohori located at the 17th km. Then a short but fairly steep uphill road follows until we enter the last 4km. which are the same as in the beginning of the route with the respective small uphill and downhill till the finishing line in Costa Navarino! Start – stop elevation: 6m. Route ground: 40% asphalt road, 56% dirt road, sand 4%. Power stations : 2,1 km., 3,5 km., 5 km., 7,7 km., 10 km., 12.5 km., 15.3 km., 17.4 km., 18.9 km., Finish line. All stations will have fresh water, while at the stations in the 5th, 10th and 15.3km. there will be energy drinks and / or gel. The route of 10 km. is also renewed, by giving participants the opportunity this year to run in the unique beauty of Voidokilia beach. The 10km. route again this year has small differences in height and consists of approximately 50% dirt road and 50% of asphalt road. The 10km route starts inside the facilities of Costa Navarino at the bicycle rental area (Navarino Outdoors) and is directed towards the south exit of the complex following the asphalt road slightly uphill for about 500 meters. After exiting the complex, the route turns sharply right into a dirt road towards the beach and downhill. After a distance of running by the sea, it diverges from the beach and follows an uphill track up to 2.1km. (Power Station) where it turns right into a narrow path for 100 meters. A steep dirt road follows up to 3rd km. which is the most “difficult” part of the route. From the 3rd km. up to the 4th km. the road is downhill and asphalt. From the 4th km. until the 6th km. is the most beautiful part of the route as it is located in Voidokilia region. The ground is dirt road and runs parallel to the wildlife shelter of Lake Divariou which ends at Voidokilia beach. At this point the route follows the golden sand by the sea for about 300 meters and the road back begins. The first part of the way back is a dirt road without any particular inclination and then it diverges from the lake and follows an uphill part from the 6th km. until the 7th km. which is the most “difficult” part of the return. Afterwards the corresponding downhill follows from the 7th km. up to the 9th km. Then we have the last slight uphill part of the route and we reach the finishing line. Power stations: 2.1km., 4km., 6km., 7,9km., Finish line. The shortest route of the event is 5km., which is quite easy and “friendly” with small height differences and moves about 90% on dirt road and 10% on asphalt road. 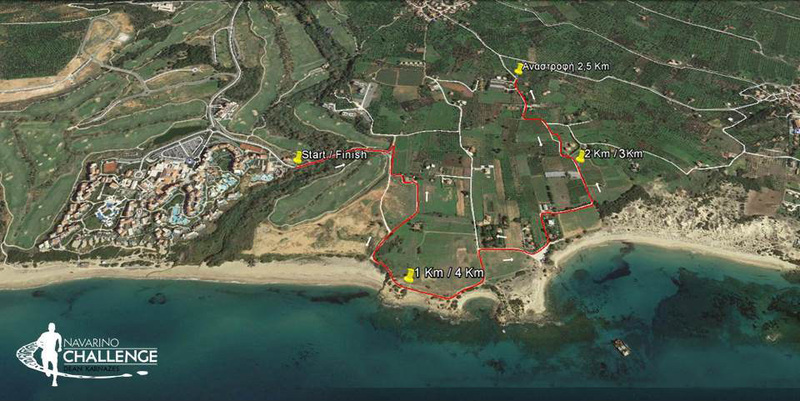 The 5km route starts inside the facilities of Costa Navarino at the bicycle rental area (Navarino Outdoors). It starts slightly uphill and is directed towards the south exit of the complex following the asphalt road slightly uphill for about 500 meters. After exiting the complex, the route turns sharply right into a dirt road towards the beach and downhill. After a distance of running by the sea, it diverges from the beach and follows an uphill track passing by the Power Station (at 2.1km.) until the turning point at the half of the route (2.5km) which is the most “difficult” part. On the contrary, the way back starts with downhill dirt road up to 3.8km. where an uphill part starts for 700 meters. The last 500 meters of the route are slightly downhill. Route Ground: 90% dirt road, 10% asphalt road. Power stations: 2.1km., Finish line.